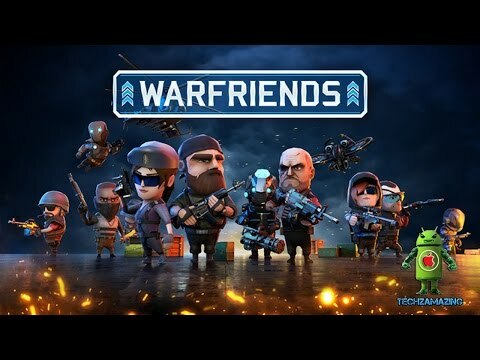 WarFriends: PvP Shooter Game is a mobile video game that was built to be played on Android and iOS mobile platforms. It was developed by a game developer known as About Fun and Published by Chillingo. Its early access original release was done on 7th October 2016. However, the full version of this real-time strategy game was officially released on 17th January 2017. The recorded number of downloads had surpassed 5 million users by April 2017. The Warfriends game is mainly based on the cover of a third-person shooter. It runs on the Unity engine and features both single and multiplayer modes. The player is a soldier with the ability to move between many covers that exist on the map. You engage in shootouts with opponents who are also real players. The battles that are mainly player versus player are fast-paced but you can form alliances with other players to help go up the leaderboards. At the start of the game, you’ll get the opportunity to an army comprising soldiers with varied abilities. The recruitment may have those who can shoot shotguns, jet-pack troopers or drones to enable you to form a very strong army. In the meantime, there are Warcards that are collected in the course of the game. The games are stacked to form decks that are useful for amazing perks. They can help in slowing down the opponent, boosting weapons and inflation of the enemy heads to improve your ability to target among other things. In participating in online war games, the player can pick friends to form a squad and use them to help in engaging in death PvP matches that are ranked. The squad can take part in chats with each other in a chat room in order to plan their strategies. The squad is very useful for climbing up the leaderboards which then will afford you some bragging rights all over the world. There is the Warpath gaming mode which you can take part in with friends. Success in this mode will enable to obtain some amazing rewards. At the player’s disposal is a wide variety of weaponry such as sniper rifles, shotguns, and bazookas to help in fighting off tanks. The arsenal can be customized to meet the player’s needs. The player can form an army that is made up of their preferred warriors to help in creating a strong army. Each member of the army can be deployed to fight off foes during battles. As you collect Warcards, you make your ability to take out the opponents by inflating their heads and boosting your weapons. There exist online death-matches that a team of players can engage in. Your team can organize themselves through a chat room and strategize on the best way to conduct their attacks and defences. The arsenal of the player can be customized to enable them to challenge other players in the online platform. This game has a lot of weaponry that the player can pick from and form his/her own arsenal. This greatly enhances the players fighting capacity and strategy. • The simplicity of the game makes it easy to play. WarFriends: PvP Shooter Game is the ultimate PvP shooter game that engages the players sufficiently. The fact that it can be played on both Android and iOS mobile platforms make it available for easy download and online gaming.